When choosing a cloud hosting service, you need one that is trustworthy and legitimate. One of the worst things that can take place is losing your files that you’ve uploaded to a cloud storage site. With many cloud storage options on the market, it can be exceedingly difficult to choose one that provides you with the quality and capabilities that you need. As you search for a service, a few of the most important factors to take into consideration include the mobile applications, the setup and features, whether you are getting what is advertised, and the security of the cloud system. With so many cloud hosting services on the market, JustCloud’s name often gets lost among them – and for a valid reason. JustCloud’s services stem from a group of brands led by Just Develop It! Just Develop It! doesn’t solely practice cloud hosting, but also offers an array of other service such as web hosting and online backup. As a result, JustCloud’s storage system isn’t designed to its full potential. JustCloud essentially offers users a basic cloud hosting service, without many advanced specialty services. While the service is simple, there are still a number of worthwhile benefits to choosing this economic and plain option. Above is an image of the information that JustCloud provides before backup takes place. The cloud storage system notifies you of available space, how many files total are backed up, and your current backup schedule. You can direct the system to back up on your preferred basis. If you don’t want to automatically backup or if you want to back up at a time apart from your set schedule, then you can also use the system’s drag and drop feature. The drag and drop feature allows you to simply drag files to the program from your computer. Overall, this process is extremely simple to use and it does get the job done well. Another consideration that you should be aware of when choosing a cloud storage system is the system’s ability to backup files. Different systems will provide you with different cloud storage sizes. 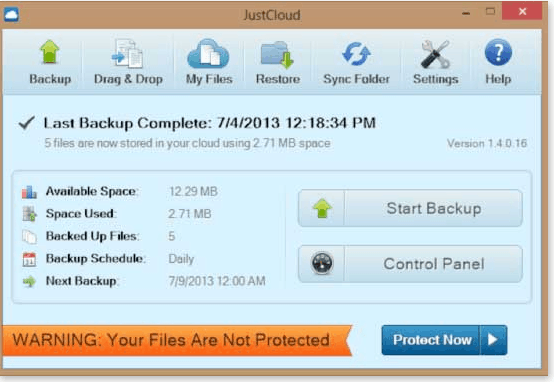 When it comes to JustCloud, the file size that you can back up is pretty limited. Based on JustCloud’s information, those who use the system have pretty limited options when it comes to backing up files. If you’d like to back up beyond 5GB, then you’ll need to pay for add-on services, which is an additional $19.95 per year. You’ll notice the full and total price with this service once you read through the cost section. In addition, another limitation when it comes to storage is mobile flexibility. JustCloud is not known for its ability to alter file size setting on mobile technology. This can make using the system a bit challenging, especially if you are looking for advanced mobile capabilities. Despite JustCloud being a simple service, there are still a number of features that make this system worthwhile to use. The features listed below are provided to users with no extra charge. Sometimes, you may require some help with your backup storage system. It may be the case that files aren’t uploading or you can’t get your files to sync. Either way, you should be able to rely on an apt technical support team to help you out efficiently and effectively. When it comes to support, the only way to reach the team is by emailing them. This can be a bit of a daunting process, especially if you are waiting for a quick response. If you aren’t able to email support, you may want to try looking at the systems frequently asked questions, as there might be an answer there. In terms of email support, responses are usually issued out within 24 hours, even over the weekend. For most people, one of the main concerns is the security of their files – and rightly so. There is nothing more worrisome than facing the compromise of your information that is held on a cloud system. For the most part, JustCloud’s security features are quite promising. User files are protected by AES 256-bit encryption and Go Redundant storage to secure the files. While these are certainly good security features, they aren’t the greatest. Other cloud systems can provide better security – which may want to make you think twice about your decision. One of JustCloud’s most significant shortcomings is its mobile technology capabilities. When using the mobile system, most files take a very long time to load, especially photos. Due to the speed issues and limited view abilities that the app has, it is obvious that JustCloud could have been better. 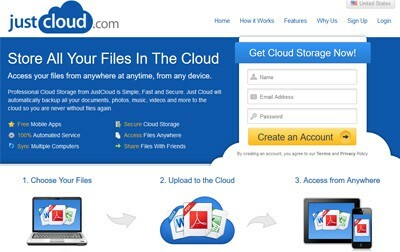 The free account through JustCloud is hardly effective and it provides extremely limited storage space. There is a loyalty system in place to help you gain points to increase your storage, but this option is extremely difficult to take advantage of and most likely operates as a marketing gimmick to induce you to pay for a larger account. Keep in mind that these prices are not fixed. If JustCloud wants to change its prices within the two years of your subscription it can, but it must at least provide you with notice. 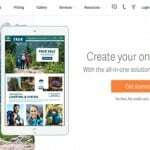 Overall, JustCloud is a simple service and works fairly well for those who are looking for an option with limited capabilities. The prices are also quite low, especially compared to other hosting services. If you are looking for more advanced capabilities, then it may be best to opt for a different choice on the market. Provides simple process in backing up files. You have the option to backup files automatically or not. If you're a student and you want to back up and share files without a cost, you can also choose its free account although it has limited storage. Poor mobile capabilities.